Richard is a writer for hire with a unique passion for health and fitness. His work has appeared on Lifehack, Livestrong, ThriveGlobal and other prestigious publications. When he's not helping clients grow their businesses, he works out, plays the violin and has fun by all means necessary. Whether you're looking for a challenging cardio workout to mix things up or just want to feel badass on your weight-loss journey, kickboxing won't let you down. It's a full-body workout that helps to build strength and cardiovascular fitness. But as fun as it is to hit the gym, it isn't always feasible. Sometimes you just want to stay home and have a great kickboxing workout that aligns with your schedule. And you know what? It's totally doable! Doing kickboxing workouts at home can be great, especially if you prefer exercising solo. But there are a few things you'll want to keep in mind before converting your living room into an at-home kickboxing studio. Cardio kickboxing is known for leaving its participants almost breathless. "The general rule is that if you can talk, you didn't go hard enough!" says Zachary Phillips, martial artist and kickboxing coach. That said, if you're an absolute beginner, you need to go easy on yourself to avoid getting injured or burning out. "Rome wasn't built in a day. You can't come in thinking you're Bruce Lee or Mike Tyson after five workouts; it's not going to happen," says Le Jon Guillory, kickboxing instructor at Body by Le Jon. So start off with shorter sessions, master the techniques and monitor how your body responds. According to former professional kickboxer and gym owner, Jimmy Fusaro, no more than eight rounds of three minute each is a good starting point. The amount of space you have impacts the effectiveness of your training. After all, you don't want to be kicking your sofa. So if you're working out without a bag, you should have at least your height in space behind you (so if you're six feet tall, you'll need six feet of space) and half your height on each side, says Joseph Andreula, CEO of CKO Kickboxing. On the other hand, if you'll be working with a standing bag, you'll typically need about 100 square feet of space, says Guillory. If you can afford to dedicate an entire room (or at least a good percentage of a large room), that would probably be best. If there's one thing that can make or break your kickboxing workout (or any workout, really) — it's breathing. "I don't care how big or how strong you are, if you don't know how to breathe, you won't be able to produce the amount of power you're trying to create with your punch or kick," says Guillory. 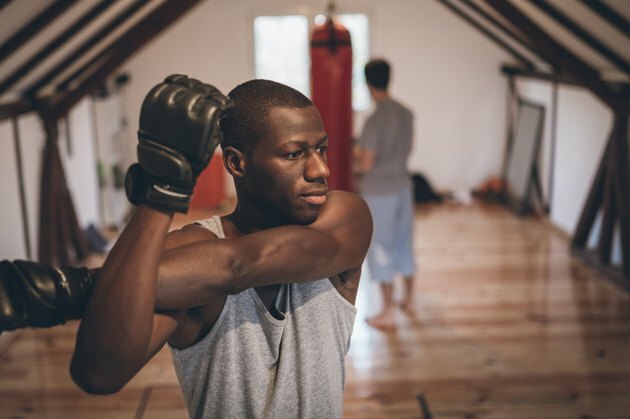 Kickboxing is mostly a cardiovascular exercise, so if you want to last long in the ring (or on the mat), you need to optimize your breathing. "Inhale through the nose and exhale through the mouth when you strike," Andreula says. "Focus on your breathing as you strike." While shadow kickboxing (kickboxing without a bag) requires nothing but the motivation to keep punching, it's not quite the same when working with a bag. So if you need to let out frustrations on a bag, Andruela recommends a a foot Muay Thai bag, resting on the ground, for at-home kickboxing. That's because it allows you to incorporate low kicks. That said, the Muay Thai bag offers a formidable resistance when hit, so make sure to protect your limbs with hand wraps, boxing gloves and shin guards. "If you're punching the bag and your hands aren't properly wrapped, you create this soreness around your wrist, and I don't wish that upon anyone," Guillory says. Always warm up for at least three to five minutes before your workout. Jumping rope and dynamic stretches are both great options. Don't lock out your elbow during shadow kickboxing. "Extend your arm or leg to around 90 percent and pull it back in," Andreula says. Keep a straight, strong wrist when throwing a punch. When throwing a kick, strike with the shin or instep — never with the toes. "Don't punch walls... the wall always wins," Fusaro says. Essentially, kickboxing boils down to two basic moves — punching and kicking. But before you do either, you need to establish a proper fighting stance. Stand with feet shoulder-width apart and bring your dominant leg back, slightly bending your knees. Bring your fists to your face, keeping them loose. They should only clench when you're making contact. Focus on throwing long, straight punches from your chin and back. 1. Jab: With the lead hand (the one in front), punch straight out, keeping the wrist straight and turning the fist palm down as you make contact. 2. Cross: With the rear hand, begin by turning from your rear hip, and then swinging with the rear hand, turning the palm down and keeping the wrist straight. 3. Hook: Hooks are thrown with your arms at a 90-degree angle (like you're holding a coffee mug). Keep the thumb wrapped and the wrist straight. 4. Uppercut: As a beginner, throw the uppercuts palms up at belly button level, turning the hips with each punch. 1. Front Kick: Raise the knee to the chest and kick the bag with the bottom of the foot. Afterward, bring the leg back to its original position. 2. Roundhouse Kick: Step out with the lead leg, opening up the hips. Strike the bag with the rear leg shin or instep, and then bring the leg back to its original position. Now that you've learned the basics, you need to put it to practice. So get off your chair and get ready to torch those calories. Try this cardio kickboxing circuit, or Guillory recommends checking out the Grokker video library for more kickboxing workouts.